Donald Clark Plan B: Lecturing - stupidest profession? What is Plan B? Not Plan A! ONE thing could revolutionise education. Force teachers, trainers, and especially lecturers, to record their efforts. Suppose that a movie was only shown once, your local newspaper read out once a day in the local square, a novelist reads his book only once to an invited audience. That’s live lectures for you. It’s that stupid. Put aside the hopeless nature of the lecture as a teaching method (I actually don’t see the need for live lectures at all), why don’t lecturers record their lectures? What do they fear? Don’t they want their audiences to learn by being allowed to view it again and reflect? It basically shows a complete lack of professionalism and lack of awareness of the psychology of learning. Good news is that I’ve seen a flurry of activity around recording of lectures. There’s lots of systems around and lots of debate around the best method. I’m simply in favour of anything, no matter how simple, on the principle that anything is better than nothing. Students are already using mobiles devices to record lectures – phones, iPODS and laptops. 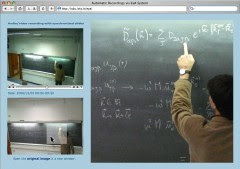 Marco Zennaro, of the International Centre for Theoretical Physics in Trieste, showed me a superb system that videos the lecturer as well as taking stills of the blackboard every 15 seconds. It took some time for lecturers to accept the system but they now have 100% use. Students love it. The use of the recorded lectures is way beyond that of the live lecture in terms of learning time and they’ve distributed lectures worldwide. The key is to keep costs low and automate as much as possible. With plummeting costs for cameras and computer controlled stills capture, this has become dirt cheap. A good system can be had for just a few hundred dollars. I like their EyeA system because it will capture, people, PowerPoint, chalkboard, overhead projection, slides, laser pointing – you name it, this will record it. A 150 Mb lecture plus stills can be zipped and an entire conference will fit on one DVD or put online. It’s that simple. These guys really practise what they preach as they are world leaders in distributing mathematics and physics to the developing world. Students are watching 13 hours a week on average, completely revolutionising the traditional teaching and learning model. There’s also the possibility of monitoring and improving the quality of the lectures themselves. So the advantages are mind numbingly obvious. You can stop, rewind and repeat. You can watch them at any time. You can watch them at any place. You can take notes second time round. You can stop and drill down on a point through research, then resume. You can move through the course at your own pace. A server is used to automatically store and distribute lectures, in ZIP files, but as worldwide demand has been so great they allow content to be set up on proxy servers and even sent hard discs by plane to places in Africa, where it’s cheaper to fly the data than download it. DVD distribution has been very successful in the US. Colleges such as Aiken College record to DVD then allow the lectures to be checked out of the library. It’s not just that students want to see them again, at their own pace. Some students miss lectures through reasons such as illness. Others like to watch the lecture, then take notes, as it’s difficult to do both first time round. I am all for recording lectures, and, as you say, it is becoming more and more common. But it has it dangers. You appear to treat lectures as one-way transmission of information from lecturer to student without any student contribution. Many lecturers also have that model and they might as well be videoed. But the better ones ask questions, react to their audience, encourage student to student interaction - make students part of the event. A student looking at a recording cannot participate. The big danger is that those lecturers that do respond to and interact with their audience will start to perform for the camera instead. They will become actors instead of directors. An uninterruptable lecture is as much an abomination as a TV broadcast, but even a replayable recording is no better than a bad lecture where the only response to a question is to repeat verbatim whatever was not understood. The point of a lecture is to allow spontaneous rephrasing or elaboration to correct for misinterpretations. In the absence of that you might as well use a book or printed notes since written information is much easier to navigate and absorb than spoken. Are there really lecturers not interacting with their audiences? If yes, indeed, that would be stupid and could be recorded. But why record those lectures? Probably you could also read a book and get the same insights. So also no need for recorded lectures. What I agree on: As a trainer you should respect the time invested by your students and use face time to reach goals otherwise not or less efficient reachable: sharing, developping ideas together, getting feedback, exercise, group work and so on. For the rest: As I said, read a book. I fully agree with Mark; that recording lectures *can* be useful, but flexibility that the lecturer can have- to involve the students, to react to total blankness etc., is only available to those in the lecture. My current approach is to use Audio that's tied to powerpoint, in the lecture - so that those present can get the benefit & those who miss it can hear the extra interactions, rather than just the powerpoint slides - which aren't always (and shouldn't be, if you follow the rules about "Good Powerpoint") easy to follow without the audio. I, personally, don't have time to re-record what I say,nor to do any post recording processing. I used the word 'lecturers' deliberately as I don't buy the idea that our universities are full of 'audience participation' lectures. The vast majority of lectures are uninterrupted events as are the vast majority of conference talks. There are some interesting points made here along the lines of 'why repeat something you didn't understand in the first place' but Marco's experience in high level physics is that students often 'get it' second or third time around when they've had a chance to reflect, explore and look at other sources for comprehension. As I said, I'd much rather have a complete rethink around the 'lecture' but, as that's unlikely, lets' start with recording. My guess is that it would triple the effectiveness of the learning. This is not a guess, it's based on increased viewing buy those who miss lectures as well as increases in retention through reinforcement as well as increased understanding through extra viewing. You know what? Here's a revelation: I can enjoy a lecture. No jokes. If it's about a subject I'm interested in, and if the lecturer knows their stuff, and presents an interesting take, I can sit and listen (and take frantic notes) for ages. But don't expect me to do it day after day, hour after hour! Last week I gave a talk at Penguin Books about the implications of digital technology on children’s publishing. I deliberately divided my talk into individual parts, 10 in all, which I delivered in a particular order. I also constructed my talk to ensure that each of the 10 parts could exist in its own right or in relation to other parts in any order. Such is the nature of narrative in a digital world. Applying this principle to lectures, if a lecturer constructed their lecture in this way, and then it was filmed, it would be easily possible to produce a version of that lecture as an interactive version from which users could select any coherent part or hear the complete lecture. We have been doing this for years in relation to product knowledge programmes, filming product knowledge experts strutting their stuff, taking their powerpoint slides and producing this as an interactive presentation chunked into coherent sections, with related transcription for interactive use. Actually, in most cases it is possible to apply some coherent construction even if it was not deliberately put there in the first place. But as I’m sure you agree, Donald, lectures, certainly uninterruptable lectures, are not the future of education and not of the 21st century although your feeling that a rethink about the lecture is ‘unlikely’ is a little depressing. As an optimist I like to think that such things as the lecture will be radically rethought, but sadly, possibly, not in our lifetime. I'm using Emma's method, and find students appreciate the facility to review a lecture. I'd also very much agree with Mark that the model of learning presupposed here is a very instrumental one: I know some stuff, and I transmit it to you. As you say, there are more efficient ways of doing that than via lectures. Also, the recording model means there's no incentive to develop and review your material as a lecturer. I have given lectures on particular topics multiple times, but it's never the same lecture- and I often move away from my intended route based on how I feel thins are going. Thus, I recently gave a lecture on Ford Madox Ford and his particular brand of modernism. I made a throwaway remark at one juncture about impressionism, which Ford used as a metaphor for his way of writing. I'd assumed that the students would know what impressionism was- but looking at the blank faces all around, it was clear they didn't. Cue a ten minute digression on that subject. That may or may not be part of the lecture next time I talk about FMF- it depends on the student response to the live event. "The vast majority of lectures are uninterrupted events" - when did you count? Some statistics would be useful. Not one professor in my department that I know of gives ANY uninterrupted lectures. I remember that style of lecture in the early 1990s, but times have changed and teaching styles have changed. You also leave out learning styles and incentives for students to actually engage with material. Many of my students (ranging from 20-50% of my lecture classes) simply don't retain data or concepts that they read. It's tough for me to understand this learning style from a 1st person perspective, as I'm not myself an auditory learner. However, my auditory learners need to hear things read out loud, and often the knowledge that the lecture won't be repeated is incentive enough for them to pay attention. "increases in retention through reinforcement"
Surely this is a confusion. Increase in retention comes about through recall not repetition. You can hear a poem hundreds of times and not be able to remember it. But be forced to try and recall it three or four times and you will know it. Looking at a recording of lecture will not encourage recall - although I guess it might be used to verify that recall was correct or to correct errors. I suspect that those who read blogs are pretty sussed when it comes to lecture delivery, but my conversations with students and audiences confirm that the majority of lectures are delivered in an uninterrupted form. In fact, in some cultures, this is the expectation. I'm just back from an International conference, and th debate around this issue shiwed that in Eastern Europe, Russia and China this is absolutely the case. In the UK the majority of lectures in Universities are uninterrupted. "In the UK the majority of lectures in Universities are uninterrupted"
I am not convinced that this is true. But if it true - then surely the response should be to teach lecturers to give better lectures - not record them doing poor lectures? It is not a big deal. Given the right attitude it takes about 3 days for an intelligent professional to learn how to give a decent lesson. Then record them ... no problem. It's lunacy to have a professional teacher teach without this basic training, but believe me it's not unusual. I don't agree with the three day thing. I've seen people who've been lecturing for decades who still have no skills. My argument is that the greatest increase in effectiveness comes from recording and subsequent access by learners. Simply getting maginal improvement on the 'one dose' lecture is to ignore most of what we know about how people actually learn. "I don't agree with the three day thing. I've seen people who've been lecturing for decades who still have no skills." I train professionals to become reasonable instructors for a living. It is quite possible in three days given the right attitude (that's key). Your lecturers may have been lecturing for decades but have they recognised there is a problem and have they had any training to address it? I agree with you, interrupted or uninterrupted, it is a good idea to record lectures. I was at a seminar on creative leadership, I could attend just the later half as I had to feed the kids and then leave home. I borrowed a paper and pencil to note down an interesting diagram about the various kinds of personalities. There was analytical, drivers, amiable and expressive. Now, there all had stress behaviors related to them. There was an 'z' that depicted the path taken by one behavioral took under extreme stress to show the qualities of extreme opposite group. I lost that sheet of paper and have been searching on the web. Can't agree more. Lectures should be recorded. I see no harm in it worst come worst there will be less users, but they may solve the purpose of those who missed a portion or those who want a second look. I think that one reason lecturers per se don't like their lectures being recorded may be because of their fear of making mistakes, or at least being able to be reviewed in such a way that mistakes can be found. That's not to say that there are necessarily any mistakes in their lectures to begin with. It stems from the authoritative culture that wove itself around The Lecture. Crazy. This is 2009. Another reason could be that some lecturers believe that knowledge can and should carry copyright. There have been instances, recently where lecture notes taken by students were claimed as copyright by the lecturer. As stupid as this may seem, the idea that there is something authoritative and intrin$ically valuable about the content of a lecture $eems to persist. In these instances, the copyright seemed to be claimed on knowledge or ideas, and not on the words used to portray it, which is even crazier. Making a podcast means that it can also be copied - presumably this would be seen to be illegal unless some revenue was filtered back to the lecturer. Nothing new in the latter idea. "interrupted or uninterrupted, it is a good idea to record lectures"
Whatever the lecturere has to offer it wil gain from inceased access and the opportunity to reflect and reinforce the learning. Lecturers fear exposure. Couldn't agree more. This, I think, is the primary reason for resistance. What it shows, however, is the deeper point that most lecturers are uncomfotable with their own skills. They know how ropey the whole lecturing game is and fear exposure. I'd reverse this argument and say that one of the strongest reasons for recording lectures is to assess performance. Copyright is another issue. This is simply a matter of employment contracts. It's easy to limit 'use' to learning by students within your institution (that is their job after all). MIT and many others have been through this 'commons' mill and opened up copyright even further, and emerged all the stronger. Fully agree with Rob about the fact that recording a lecture could let it become static; that's one reason I stick to basic audio & no post recording editing; so I can bin it next year & re-do whatever it is I end up saying then. Mark also said: "Your lecturers may have been lecturing for decades but have they recognised there is a problem and have they had any training to address it?" That's a very good point! I read somewhere (& fully agree with it!) that the hardest thing when teaching is someone who thinks they know it. Audio is fine and binning last year's lecture is also fine. I have to say that I love all of the different comments everyone has made on this topic!! I believe that recording lectures is definitely a practice that all higher education institutions should be implementing. And I also agree that lectures should NOT be didactic in nature, but interactive; helping students to move from knowing to understanding and finally applying what is being taught. Most of us will agree that students learn more by attending lectures and having a chance to ask questions, but posting a recording of a lecture or the key points of a lecture in audio/video format is another great learning tool that I think creates a well rounded education program. Agreed, but I'm not at all convinced that attending lectures needs to be linked to asking questions. The questions asked at lectures are often immediate and ill-thought out, as are the responses. I'd much prefer students to ask questions online, as they can reflect, carefully construct questions on clarification, expansion or recommendations for further reading and so on. The lecturers answers woulkd also be considered and stored for refelctions and action. I actually see no need for 'live' lectures atall. I'd reverse nthe model and have lecturers redefine themselves as teachers and do seminars where questions and dialogue ar the norm, and if they want lectures, record and distribute them online. Think of it this way perhaps....that the idea for 'recording' be re-posited as 'distributed'. Take http://ustream.tv as an example. I'm a recent arrival at Plan B (via Frankie and Patrick) but enjoying it very much. I think all the points about recording lectures that are made here (post and comments) are good ones. I'll give you another: where I lecture, there is some concern that if we were to record our lectures, the university might come to regard us (and our skills) as less than essential. Specifically, we got burned pretty badly in the industrial action a few years ago, and there was some concern that if we were to have stored 'lectures' or other materials in this way then any industrial action taken could be neatly sidestepped by senior management (who might argue that the university owned the material) just hauling out the recorded stuff. Now obviously this wouldn't replace a real (flexible/interactive) learning environment, but colleagues are nevertheless concerned about becoming "dispensable". I'm not sure whether they're right to be, but I think it's an interesting point. Interesting point. I suppose this argument begs another question. If lecturers are just standing up and delivering the same lecture more than once, then why? Something that is simply repeated begs to be automated. We can't just accept public funding for processes that are so out of date that they become arcane working practices. My guess is that lecturers need to raise their game to become valuable to the organisation and, more especially students. Finally have enough time to attend, read, post, listen, watch and speak on anything I want to.